Best Western Rewards has launched new bonus miles campaign for Cathay Pacific Asia Miles members. Asia Miles members can earn triple miles (250 base + 500 bonus) for stays worldwide between January 8 – March 30, 2018. This offer is valid for eligible stays booked and completed at participating properties of Best Western® branded hotel worldwide between 8 January and 30 March 2018, inclusive. An “eligible stay” for the purpose of this Promotion is defined as one or more consecutive nights at the same Best Western branded hotel at a rate eligible for earning points or airline/partner rewards through Best Western Rewards and excludes stays booked through an online travel agency, stays booked through a tour operator, and/or stays booked at a special discounted rate. Only one check-in/check-out permitted per stay. Eligible stays which take place during the Promotion Period but have a check-in or a check-out date that overlaps with the beginning or the ending of the Promotion Period will qualify for the Promotion. Asia Miles members can earn 250 Regular Miles plus 500 Bonus Miles (equivalent to a total of 750 Miles) per eligible stay during the promotion period. This promotion may not be valid with other offers, promotions or discounts, and is subject to cancellation or change without notice. Bonus Asia Miles will be credited to the member’s account 6 to 8 weeks after each qualifying stay. 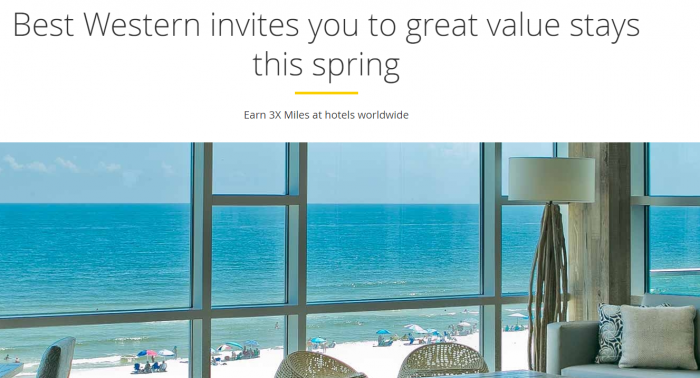 All Best Western Rewards programme terms and conditions apply.